This rotary tiller is a tractor PTO driven machine used for pudding the soil before rice transplantation, chopping and mixing of green manure, crop residue and stubbles into the soil to make it more fertile. 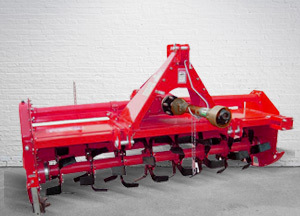 As a secondary tillage implement, it prepares fine to accurate seed-bed in one go for sowing any type of crop. The drive to the blades from the gear box is by shaft and rugged gears to give long life and reliability.